It is a clarifying moment… The x-rays are back from this laboratory. These hypothetical x-rays come from Super Tuesday of the 2016 presidential primaries. And what can be seen in these images? There it is — the often hidden, not-so-attractive, practices and support of racism. Surprisingly this racism comes from those who call themselves Evangelical Christians. It is painfully clear. Support for racial bigotry and discrimination is all too apparent in the way they vote and self-identify. The voters have spoken: Donald Trump won seven of the twelve primary elections in states. He claimed the largest percentage of the so-called white Evangelical voters. Just hours before these elections Trump dodged questions about support he was receiving from the Ku Klux Klan and David Duke, a well known white supremacist. In what has become a typical media ploy, after he winked his appreciation for the racist support, Trump then changed his tune, saying that he had always opposed racism and, in typical form, he attacked the media saying that he was again being mistreated. Can there be any doubt that behind the scenes and often breaking into the open racism has been employed to weaken the presidency of Barack Obama? Like many things, few people are as articulate in identifying such realities as is poet, novelist, conservationist Wendell Berry. Nobody can doubt that virtually all of the President’s political enemies would vehemently defend themselves against a charge of racism. Virtually all of them observe the forms and taboos of political correctness. If any very visible one of their own should insult the President by a recognized racial slur, they would all join in the predictable outrage. But the paramount fact of this moment in the history of racism is that you don’t have to denominate the President by a recognized racial slur when his very name can be used as a synonym.” (Wendell Berry, Louisville Courier-Journal, September 15, 2015. See more at: Berry, Revival of Racism. I was stuck by a recent report from the Southern Poverty Law Center that provided the recent history of active hate groups in the United States. During the first eight years of the twenty-first century there were roughly 150 groups such as the Ku Klux Klan, White Nationalist, Racist Skinhead, and Neo-Nazi. Their numbers changed very little in the period between 2000 and 2008. However, in 2009, following the election of our president, the number of hate groups rose to over 500 — and today there are nearly 1,000 such groups in the United States! I am not saying that white Evangelicals are all racists. Still it is more than a little suspicious that there is not more resistance among these folks to Mr. Trump’s dog whistle to the racist fringe. I still remember visiting a family farm, shortly after the election of Mr. Obama. These were good people, church going folks, active in state politics. I have known them for years. As we talked my friends began to share email “jokes” about our president. The language was crude, ugly, bigoted and demeaning projections. It was raw, blatant racism in the depiction of our president. I was stunned — didn’t join in the laughter and spoke only a halting word of disagreement. In hindsight, I wish I had said more. In hindsight, I understand there are such “God fearing” folks and how they could vote for Mr. Trump. In his insightful study One Nation Under God Kevin Kruse of Princeton University outlines the way the Christianity shifted in the twentieth century to become a public spiritual spectacle, useful to politicians and corporate leaders to pursue their goals of power and wealth. Kruse cites William Lee Miller of Yale Divinity School who spoke of the American people who followed their president, Eisenhower, and “had become fervent believers in a very vague religion.” (Kruse, p. 68) Or, as Robert Bellah put it, “Is this not just another indication that in America, religion is considered a good thing but people care so little about it that it has lost any content whatsoever?” (Kruse, p. 68) This vague religiosity has been filled with many things — and as Evangelicalism has gained ascendancy too much of the “vague” content has been long on self concern and short on self criticism. The vague content of American Christianity — Evangelicalism in this case, has been filled with patterns of thought and behavior that have almost no connection with the message or life of Jesus the Christ. In fact, the vague content has been filled with shabby self indulgent understandings that are amazingly at odds with the Sermon on the Mount or the Lord’s Prayer. I do not seek to salvage this word “Evangelical.” The damage, the identity theft, has been done. Such a project belongs to others. Thankfully, they are already at work and know it will take generations to correct what has gone amiss. As suggested in an earlier post, these elections provide an x-ray into the flawed theological and faith perspectives of such Evangelicals. Sadly, the x-ray comes back saying the illness is at a critical stage. This religiosity is shaped more by culture, history and prejudice than it is by the scriptures or sound theology. Honestly, it is more a folk religion than a coherent faith practice. What are we to do? What is the church to do? In his column, “The Governing Cancer of Our Time, ” David Brooks speaks of the rise of authoritarianism (Brooks, Governing Cancer). Over forty years ago, I served as part of a national research project on the church and racism. In this work we discovered the connections between authoritarianism, status concern and racism in its various forms. The question became how should the church, the People of God, respond? The church — especially the leaders in the church — must say NO to racism. That which is obvious and that which is more subtle. I wonder what difference it might have made if religious leaders and political leaders had stood up against Mr. Trump’s “birther” comments in 2008, or every year since? One can’t help but think that the current dilemma of the Republican Party was brought about by their own silence and disrespect all along the way. Sermons and study groups alone have little effect on changing racist attitudes or behaviors. (Sorry about this preachers and teachers.) However, when sermons and education are combined with activities that engage parishoners with persons of a different race, especially activities that seek cooperatively to address racism, real change is possible. We saw it in Chicago, South Bend, Fresno, Dallas and Los Angeles. Finally, a denomination’s commitment or congregation’s commitment to battle racism can be measured by the way budgets are made and expended. In 1974 we found that almost all congregations reported they spent more on toilet paper or light bulbs in a year than they did on efforts to address racism. Nothing much has changed over these four decades in this regard! Silence. Vague content to our faith. Low commitment to change as evidenced in our practices and budgets. These things, good reader, may be among the reasons for our current embarrassment. *Women viewing x-ray. Copyright: http://www.123rf.co/profile_rmarmion’>rmarmion / 123RF Stock Photo</a>. Hands of the Strong: Get Off My Shoulders! No one said it better. “Get off my shoulders! There is work to be done.” Amelia Boynton Robinson was responding to those who sought to honor her by saying they were “standing on her shoulders.” In March 1965 she nearly lost her life on the Edmund Pettus Bridge in Selma, Alabama. Severely beaten, unconscious, she was left for dead. 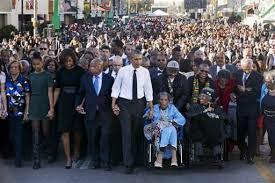 On March 7, 2015, at age 103, this time in a wheel chair and holding the hand of President Obama, she crossed the Edmund Pettus Bridge. Work to be done? In 2015? Yes, there is. Don’t we have an African American President? Isn’t this a Post-Racial society? Well, yes our president is African American… but NO this is not a post racial society. Today, less than a week after the remembrance of Selma’s “Bloody Sunday,” we see video of members of the Sigma Alpha Epsilon fraternity at the University of Oklahoma singing a song full of racial vitriol and threat. What is happening? From Ferguson, Missouri there is the tragic shooting of two police officers at a rally outside the police station. What is this about? Yes, Ms. Boynton Robinson, THERE IS WORK TO BE DONE. Racism continues to plague our society. There are many causes, many reasons. Racism remains because some view it too simplistically and some see it as overwhelmingly complex. Some seem to imply that by simply cleaning up our language and no longer tolerating certain words (or by ending fraternity songs), we will eliminate racism. I hear former congressman and television personality Joe Scarborough opining that the use of such language wasn’t a part of his experience growing up in the south or attending the University of Alabama. There was racism around but he seemed to suggest he didn’t participate. Really? The implication seems to be that if we would all just clean up our language, we could end racism. We might eliminate blatant, red-neck racist words but, while laudable, that would not be sufficient. Language, while important, is one of the least essential elements contributing to the persistence of racism. Language and behavior are not always aligned. Prejudice and discrimination can be distinct realms. Sociologists for decades have shown that what people say and how they act don’t always match. It is possible for one to have pure language and only noble thoughts (good luck with that) and still act in ways that exclude, belittle and diminish another. Racism can also appear to be overwhelming as it is so complex. Prejudice and discrimination are only two elements in this wicked brew. There are also deeply embedded institutional and cultural patterns. We could elect an African American president and still see the dismantling of voters rights in our nation. This is the other side of our dilemma — we can treat racism as so complex that there is little we individually can do about it. This is when the words “get off my shoulders” take on special meaning. We are to keep moving ahead against the forces of injustice, despite the complexities. For example, how will we now see the situation in Ferguson? There is absolutely no justification for the shooting of two police officers simply because they are seeking to keep a demonstration peaceful. My prayers are with those men who were shot — and their families. It is also my hope that arrests are made soon. The irony, of course, is that the rally on the evening of March 11, 2015 should have been one of celebration. The U. S. Justice Department had documented the on-going patterns of discrimination and institutional damages against the black citizen in Ferguson over many years. Changes were being made, judges and officials are being replaced by persons committed to making change. And what happens now? More violence. This time directed toward the police — police there from other municipalities. Is this what we have come to? Are we really so caught up in an eye-for-an-eye sense of justice that anyone could think such a shooting is justified? Faced with such patterns of revenge, I am astonished that the shooting of these officers in Ferguson did not result in greater violence. The restraint of the police officials on the scene is, in my view, nothing short of remarkable — and is doubly worthy of praise. Now the question my friend — should the protests in Ferguson continue, even after these shootings? It is not my call. Others on the scene who are committed to nonviolence need to make this tough decision. However, if there are citizens who still feel their voices have not been heard, then… yes, the right to peaceful protest remains essential. Such are the complexities of dealing with race in our time. What is on display in Ferguson requires deeper thought and careful study. The killing of Michael Brown this summer only tore the scab off of a wound that runs decades deep. I commend to the reader the exceptional research done by Richard Rothstein on housing and job discrimination in St. Louis over the past century. These decades-old practices of racial discrimination helped established the template for the challenges we face today. What is true of St. Louis is true of every city in our nation. This report can be found at: http://s3.epi.org/files/2014/making-of-ferguson-final.pdf. The mystery of why racism persists may lie in our temptation to view it too simply — or to become overwhelmed by the complexities of continuing institutional and cultural realities. Most of us live our lives in places where we don’t easily see how we can make a difference. We can be careful in our language and be nice to others but is there more? We are more comfortable standing on the shoulders of others rather than seeing the work around us to be done. This work may be as simple as greeting a friend, or as challenging as joining a protest march. Many of you make a difference every day, in your places of work or play. Sometimes it is a smile, sometimes an appreciative or corrective word, sometimes it is making a donation, sometimes it is writing an elected official, sometimes it is joining a project that affirms racial justice. This past fall a group of friends gathered in Chicago to celebrate my spouse Elaine’s birthday. 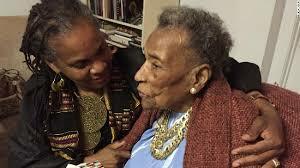 I watched and listened remembering the ways Elaine has learned and acted to seek racial justice. Like Joe Scarborough, she grew up in north Florida. She too was taught not to say ugly racist words. However, she looks back with astonishment on the reality of discrimination, segregation and Jim Crow laws in Tallahassee where she grew up. I have been privileged to watch as Elaine has journeyed ahead in her own ways, seeking to end discrimination and promote racial justice. Her work over the years as teacher, school board member, advocate for justice and her life as friend to so many signals an abiding witness to the work that still is to be done. Recently I was surprised when Elaine said she had arranged to volunteer in a school nearby. I was proud for her and I also chuckled to myself when thinking about the witness Elaine will be making. 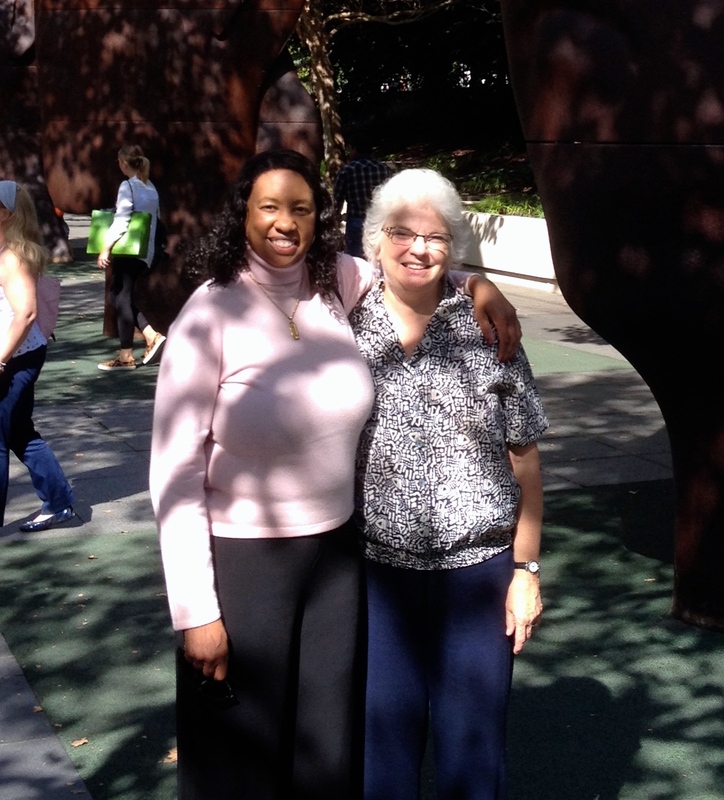 Dr. Adrienne Mims and Dr. Elaine Amerson, September 28, 2014. There is work that we all have to do. Won’t you join?